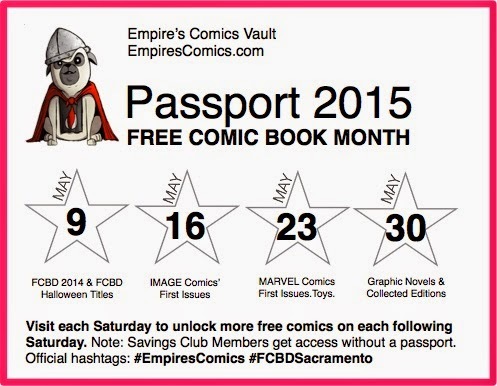 Here at Empire's Comics Vault, we celebrate Free Comic Book Month (FCBM). But, wait, you already know this. What you need to know is that store hours are regular Saturday hours for the rest of the month. We open at 11 a.m. on Saturdays. Bring this each Saturday. You need it to get freebies. 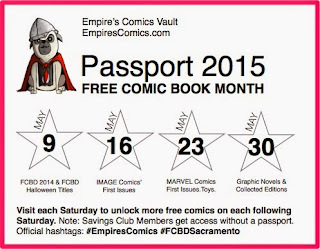 Well, we're sure you picked up your FCBM Passport when you were here for the Free Comic Book Day Mini-Con. Good. Bring it with you. You need it to access the freebies. We'll mark off the May 9 star so that you can gain you entrance to the March 16 freebies. If you miss even one Saturday, then you're out for the month! And trust us, you don't want that to happen. There's some cool stuff to be had (while supplies last, naturally). 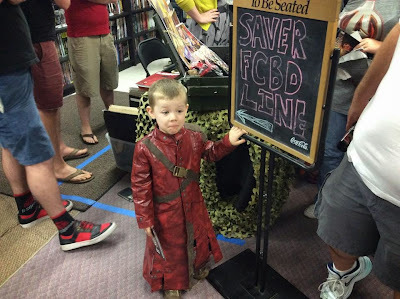 NOTE: This year, for the first time, we have given Savings Club Members complete access to each and every Saturday, whether you were at FCBD Mini-Con or whether you miss a Saturday. For you, it doesn't matter. If you're not one of our Comic Book Savings Club Members, why not? It only takes one title. Put one title on a list, we'll pull it for you when it comes out, pick up at least once a month, and you'll gain access to amazing savings and special access at FCBD Mini-Con and FCBMonth every year. Ask Ben for a sign up form when you come in and he'll get you started. May 9 - Miscellaneous Free Comic Book Day titles from 2014 and Free Comic Book Halloween comics from 2014/2015. JUST ADDED: 3 different Valiant previews and one Titan comics preview comic book.